Janice and I like to avoid doing the same thing over and over again. 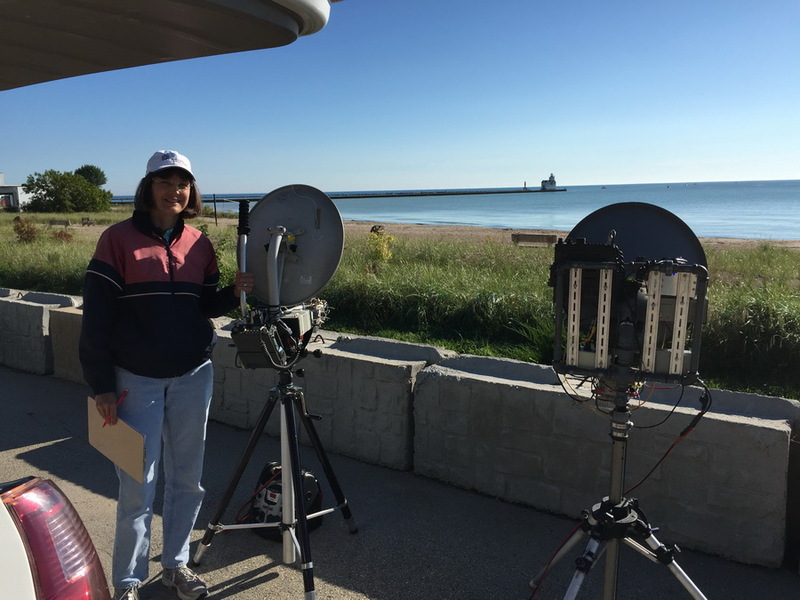 So for this year's September portion, we decided to join the annual activity on Lake Michigan. 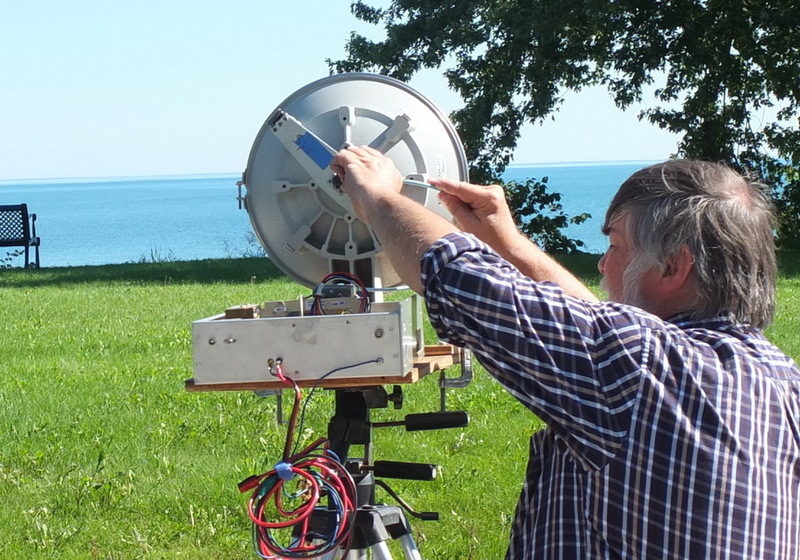 Michigan and Illinois microwavers seem to pick the September weekend each year to "light up the lake" with RF. In the week leading up to the September weekend, I sent out email promotion to all the known and prospective players in the region. I figured that by knowing people's plans, each of us could pick operating behaviors that maximized opportunities for additional contacts. As part of the email promotion, I whipped up the graphic above to give folks an idea of what activity to expect. 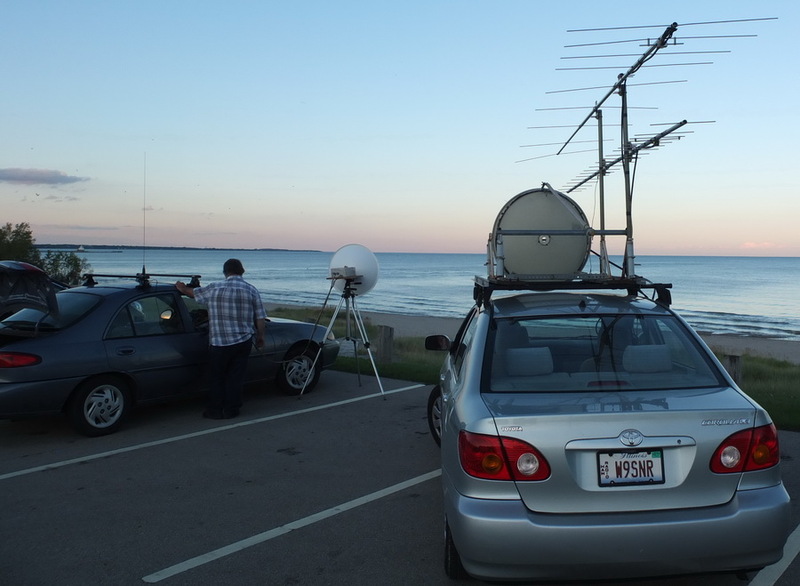 Our plan was to join up with a rover pack consisting of Pete, K9PW, and Zack, W9SZ. We knew that Mike, AA9IL, and Jim, W9SNR, would join the rover pack at some point. 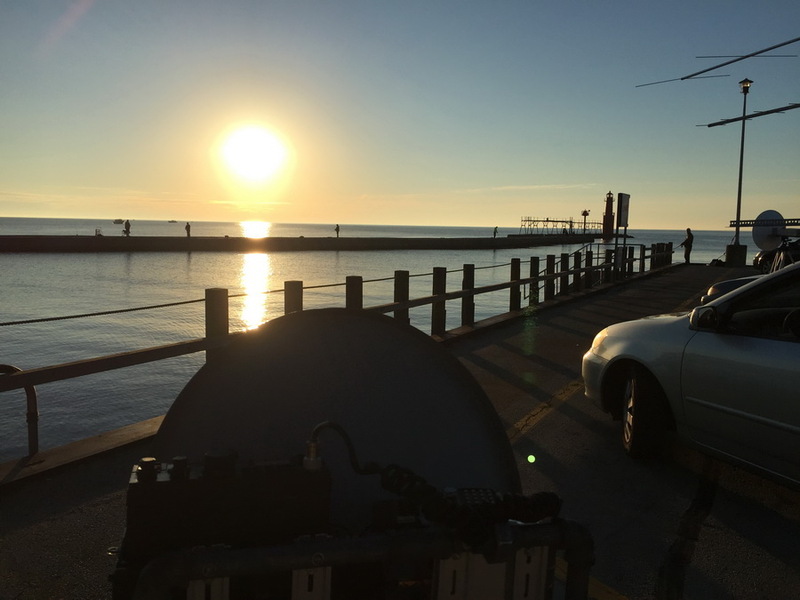 Pete and Zack started on Lake Michigan north of Chicago at 7am on Saturday. 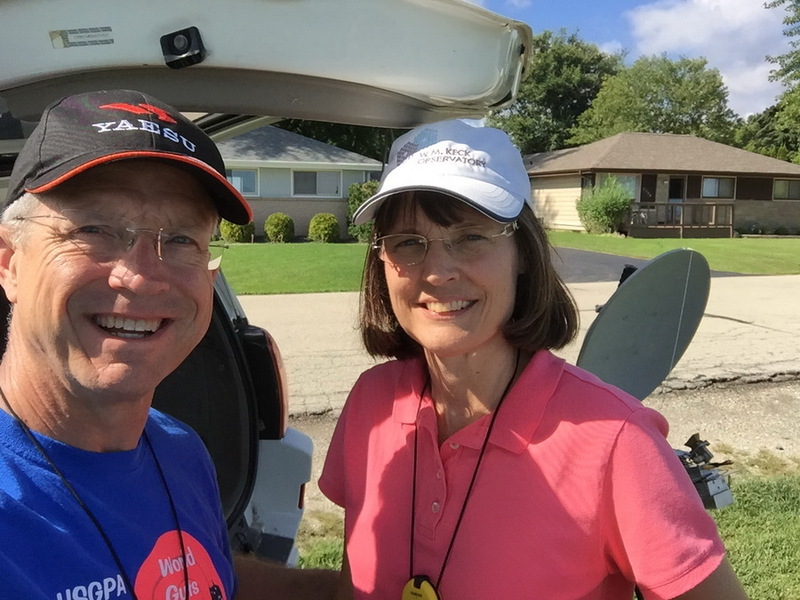 Since Janice and I were overnighting Friday night at her Dad's house northwest of Milwaukee, we knew we could not start that far south. We started our day at 8am at Pennoyer Park in Kenosha, WI. The grid here is EN62co and the distances to the Michigan operators were 260 to 294 km. 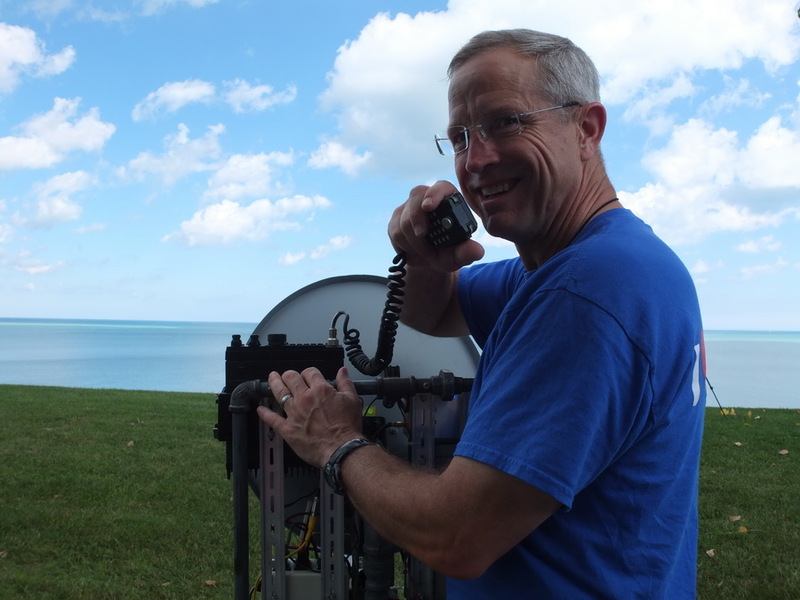 Signals were not too strong and CW was used to make sure of good contacts. 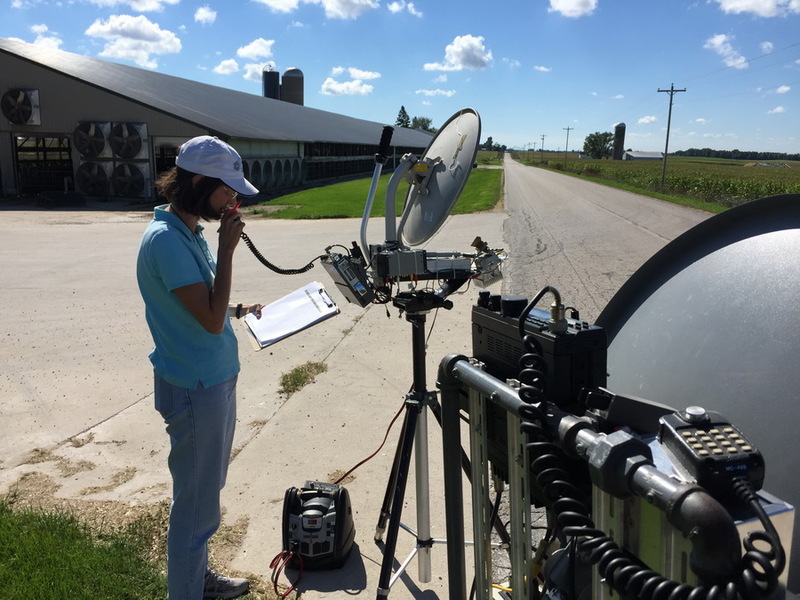 Here Janice, KA9VVQ, blasts through trees to work K9PW and W9SZ, who are still about 25 miles away in Illinois. I don't follow instructions very well. Here is Pete, K9PW, at Chapla Park. 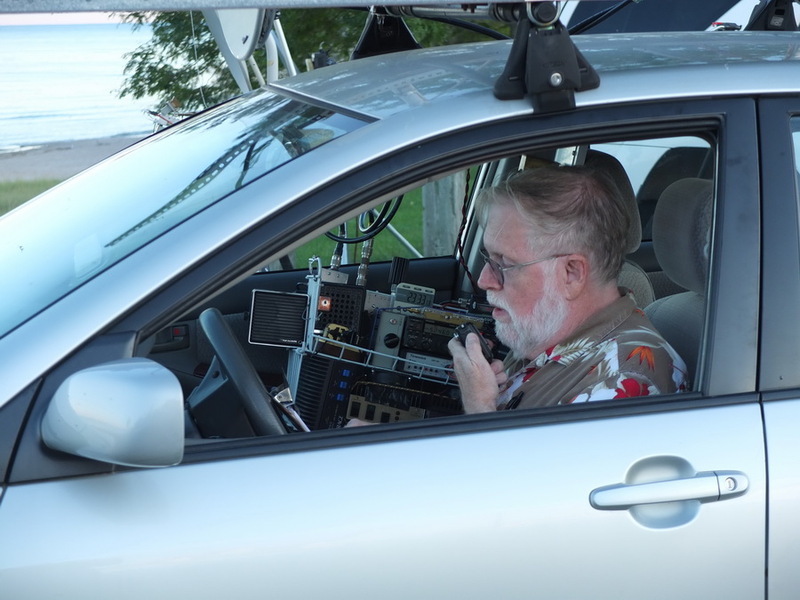 He uses an Elecraft K3 with a panadapter for his IF rig. He needs to keep it in shade in order to see the panadapter well. 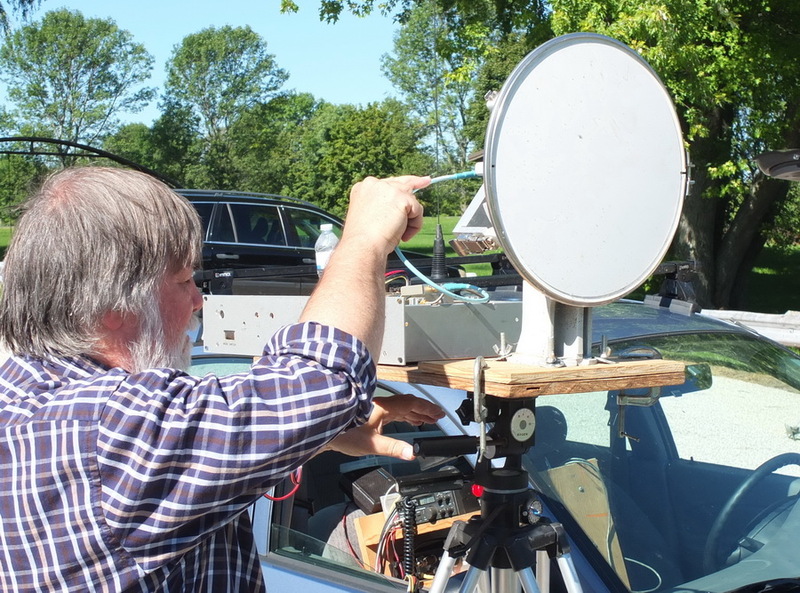 And it's all a bit large to mount on a tripod--but boy does it perform and the panadapter is a real help in spotting signals off frequency. 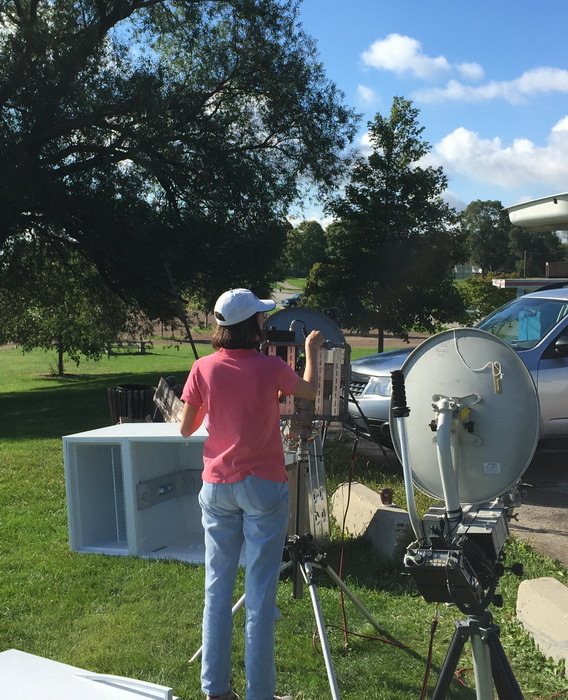 His 10 GHz and 24 GHz transverters are on the tripod. Switching between bands takes less than 30 seconds. 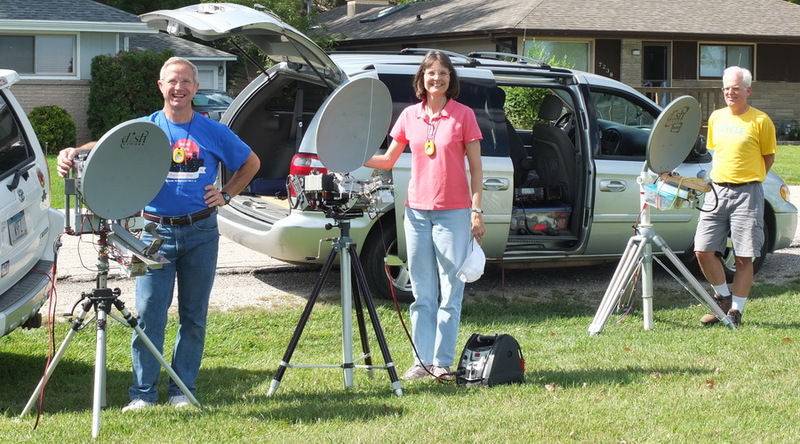 Bruce, W9FZ, Janice, KA9VVQ, and Pete, K9PW, at Chapla Park just north of Racine, WI. The weather continued to be spectacular. This is grid EN62ct. Distances to the Michigan operators ran from 229 km to 274 km. Next stop was the south side of Milwaukee. We call it "South Shore" because it's on South Shore Drive between Bay View and St. Francis neighborhoods. 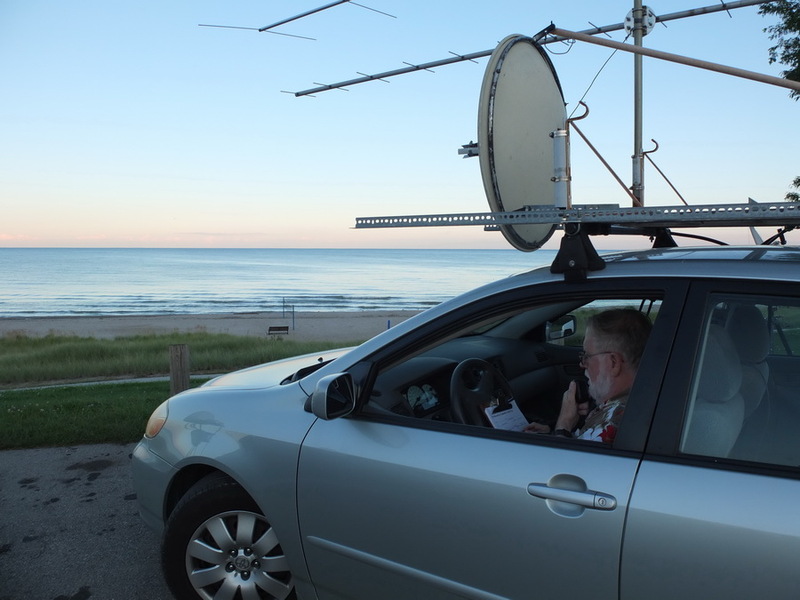 Here is Zack, W9SZ, all set up to work Michigan. Zack reports that each year a woman comes out from the houses saying "I was expecting you to return". 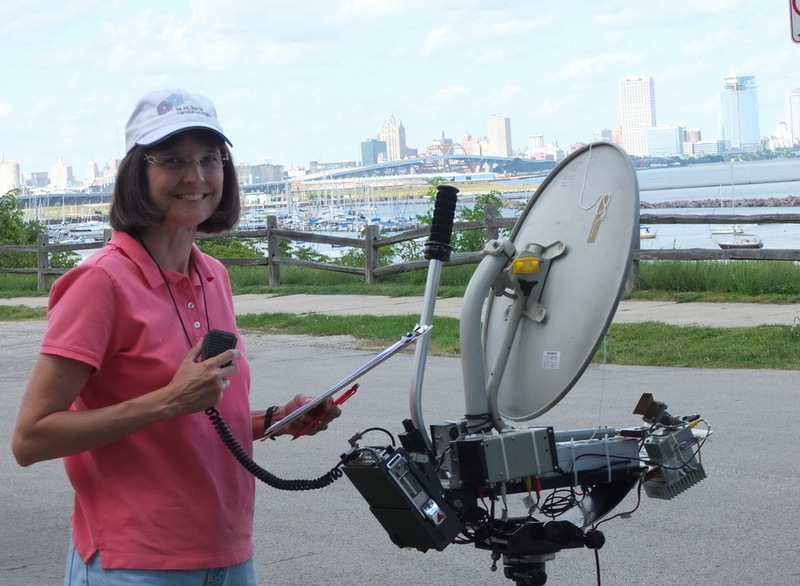 Here is Janice, KA9VVQ, with a view of downtown Milwaukee in the distance. Janice and I then broke from the rover pack and proceeded to Ken's, W9GA's, house (EN53ve), who we knew had a great view to the south. There we had lunch and worked W9ZIH on an easy path. Tried unsuccessfully with N4PZ. 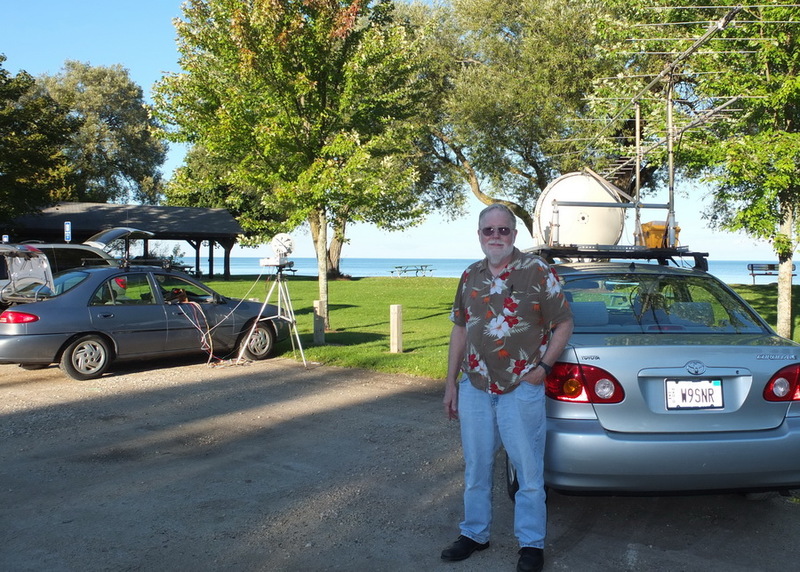 Although we missed two lakeside spots with the rover pack, we rejoined them at Hika Park north of Sheboygan. This is grid EN63dv. 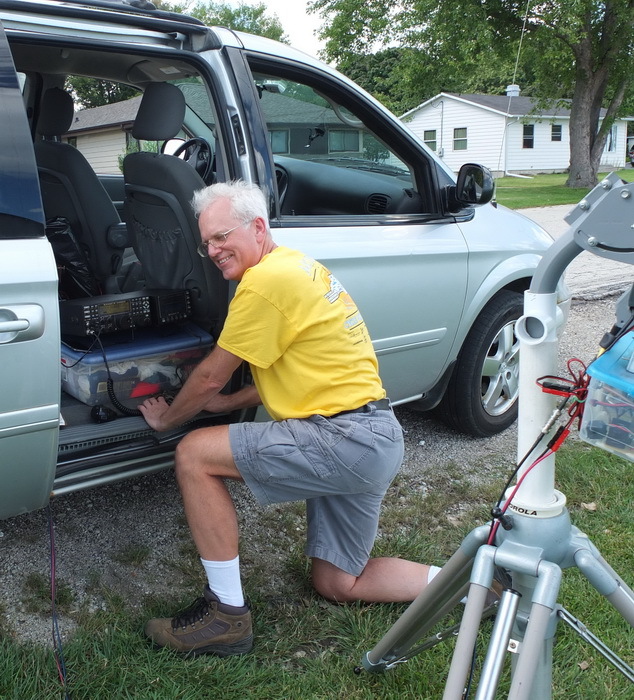 Here is Jim, W9SNR, beside his rover station. 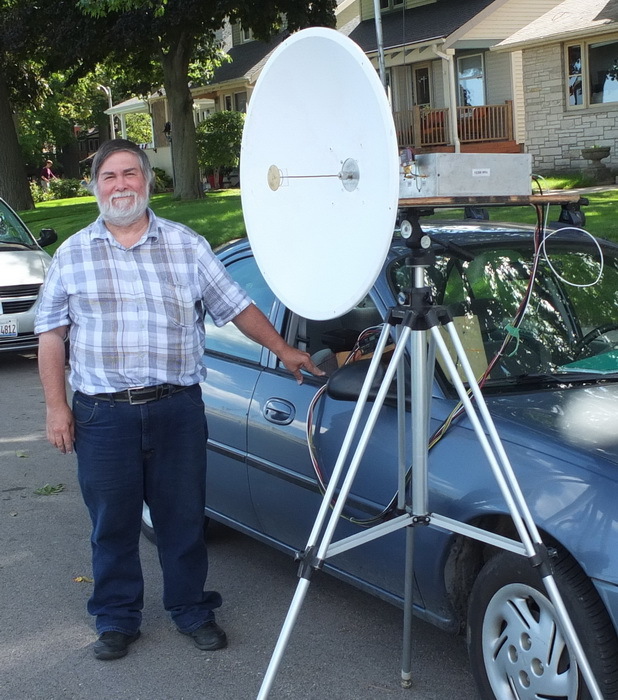 He has a dish on the roof and all the radios inside the car so he can operate in the rain if need be. Here is Mike, AA9IL, at Hika Park. Now signals were getting quite strong. But then, distances had shrunk to 146 km to 178 km. The last stop of the day was at Red Arrow Park in Manitowoc, WI. It celebrates the 32nd Armored Division (The Red Arrows). The grid is EN64eb. 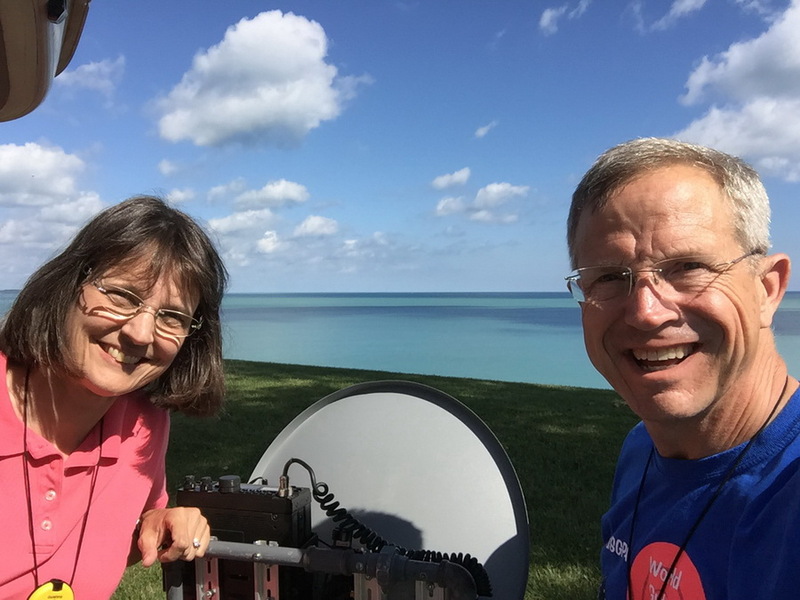 Here Jim, W9SNR, and Zack, W9SZ, are beaming K2YAZ over in Glen Arbor, MI. After we shut down here, we convened at the Courthouse Pub for a fine dinner and beverages. The six of us socializing after a "hard day of radio" was one of the highlights of the weekend. Sunday morning we started bright and early at 7am at the marina/boat dock in Algoma, WI. Here is the best group picture of all of the roverpack for the entire weekend. Pete, K9PW, Zack, W9SZ, Jim, W9SNR, Bruce, W9FZ, Janice, KA9VVQ, and Mike, AA9IL. The paths were only about 100 km from here. Signals were needle pinning loud. From Algoma, WI EN64go we were beaming pretty much right into the sun. 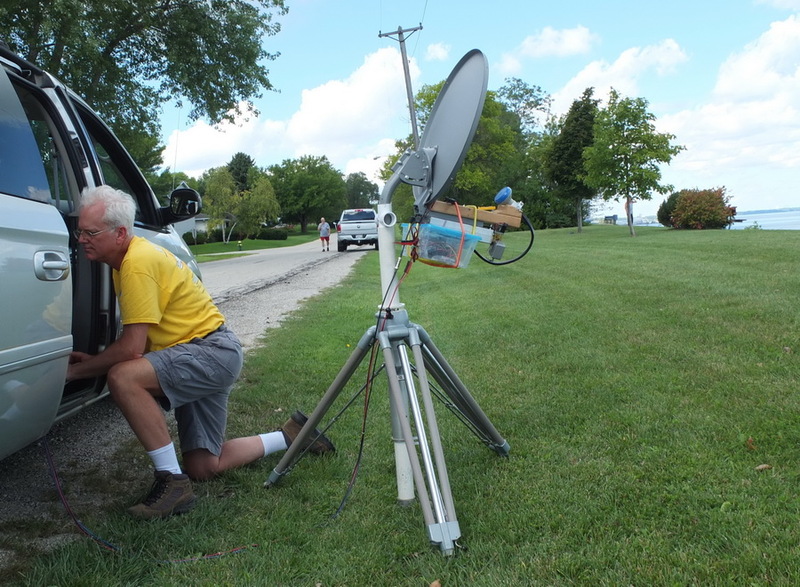 Second stop on Sunday was at a park in Kewaunee, WI (EN64fk). Third stop was a boat landing called Twin Creeks (EN64fh). Signals were still very strong and probably enhanced by the "evaporative duct". It's a duct bounded on the top by a change in humidity rather than temperature. The refraction index changes quickly enough to make it a boundary and a duct. The one photo of the lake horizon shows a visible layer that we think is coincident with the "evaporative duct". 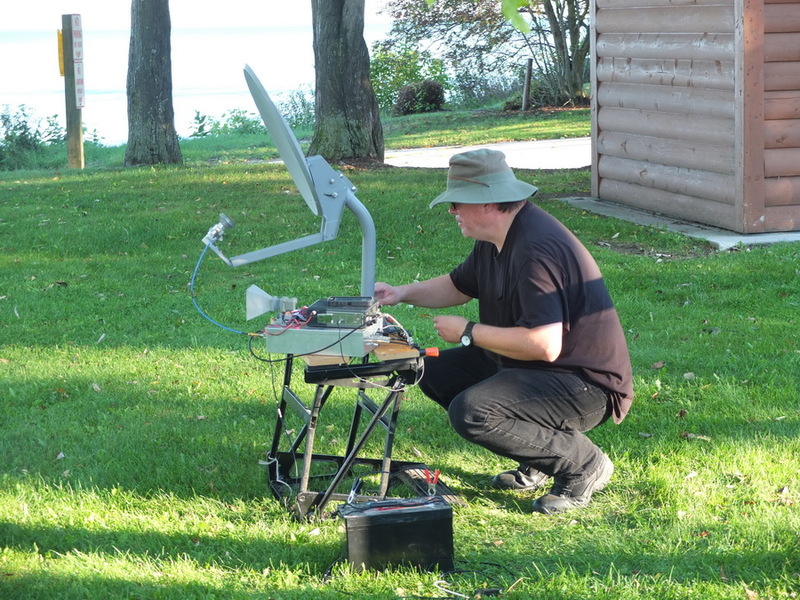 Zack hooks up his 24 GHz gear for contacts with Michigan. They were successful. 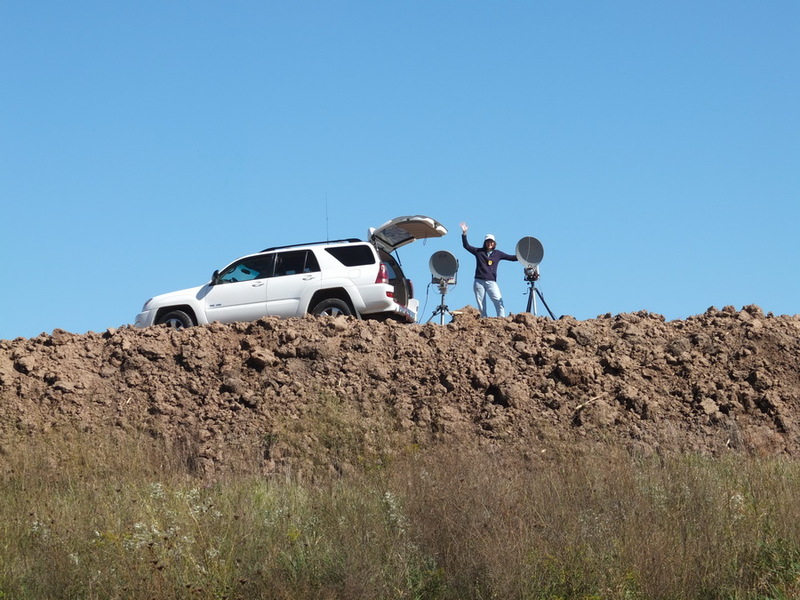 We got a text from Greg, KA9VDU, who was set up in central Wisconsin, wondering if we were available for an overland shot. 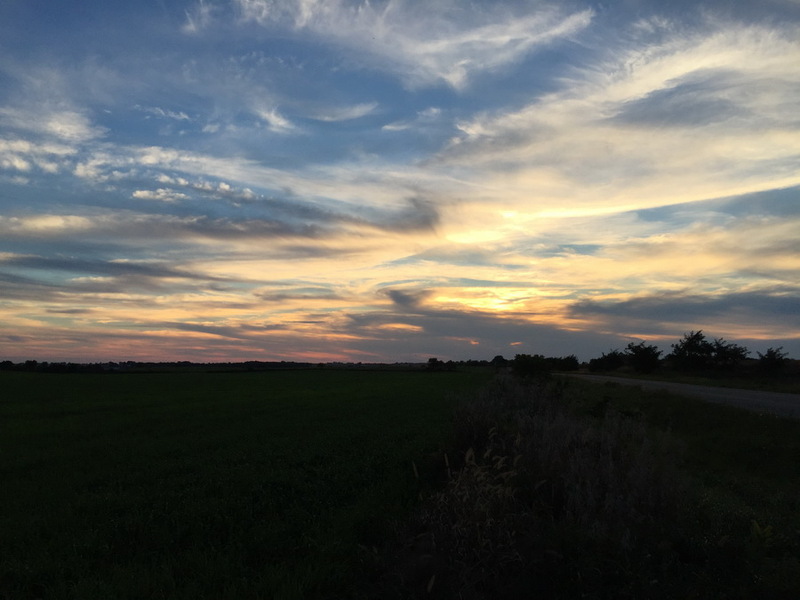 As we drove from Twin Creeks to Manitowoc, we stepped 3 miles inland and noted a nice horizon to the WSW. We set up and started beaconing in his direction. He texted that he was hearing us. So we listened and peaked up on him for a nice SSB contact. Admittedly it was only 115 km, but it was worth doing. Here is the view in the direction of KA9VDU. Based on his report of the location he was at, we made a point to end up there as our last stop of the day. About 1pm, we parted with the rover pack and proceeded inland on a path towards our cabin in SW Wisconsin. 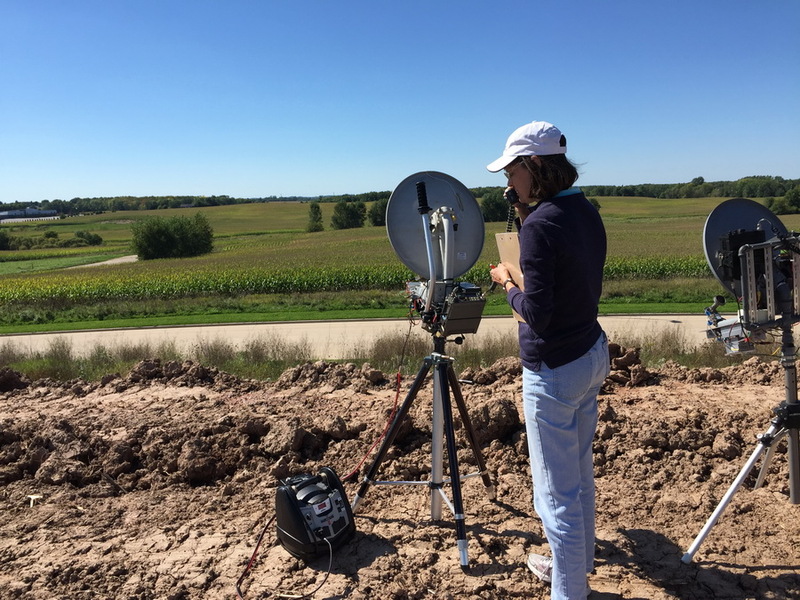 We started scanning the map book for likely places to make attempts towards W9ZIH down in Illinois and the Twin Cities operators on Buck Hill. As we headed out of Manitowoc on Hwy 151, we recognized a business park where we've operated VHF from in two January contests. 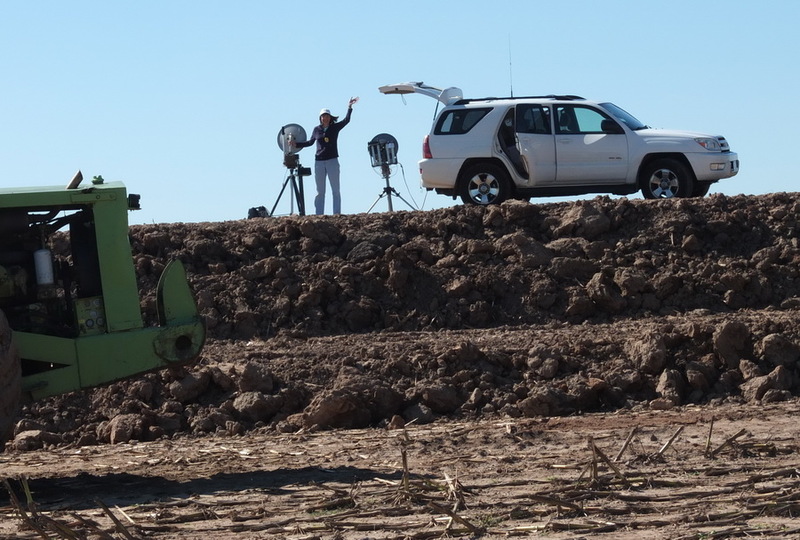 We drove back in there and spied a new construction site. Hmmmm, a pile of dirt. 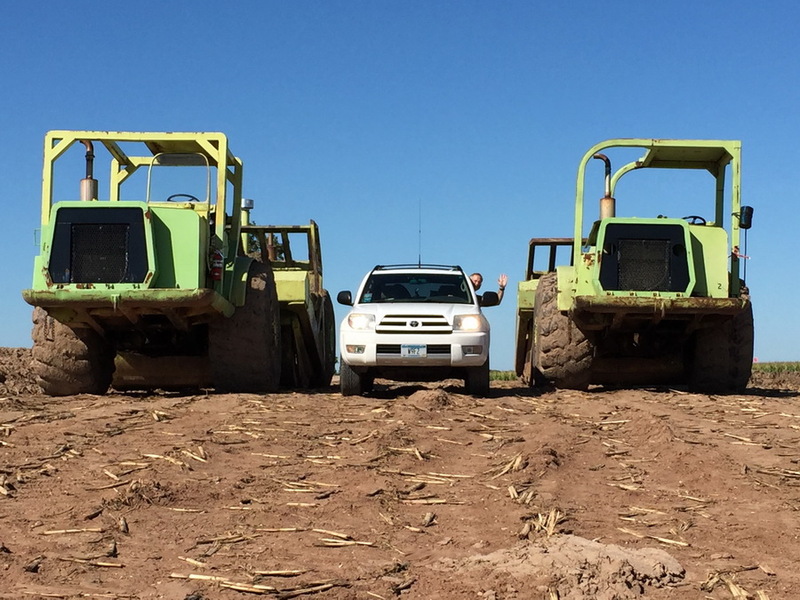 Turn on the 4-wheel drive and let's get up there! 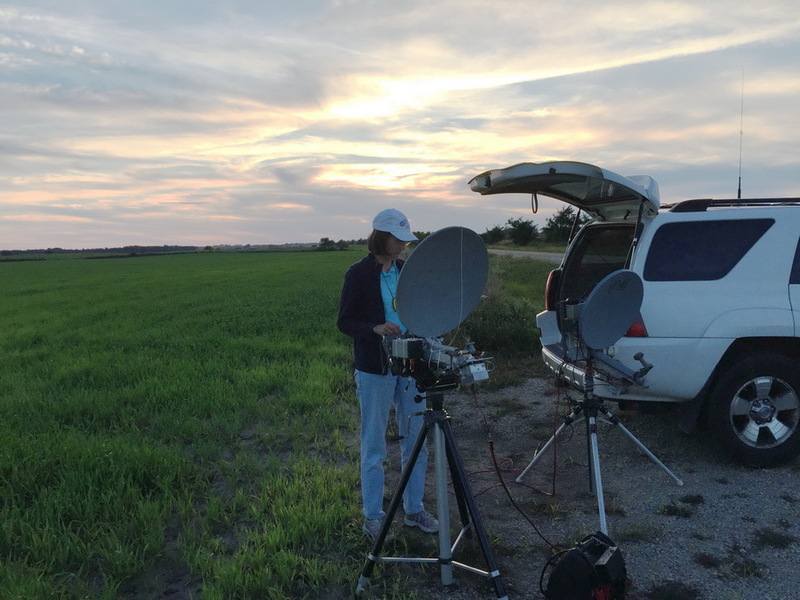 In the left picture above, Janice is completing a 100 km QSO with Greg, KA9VDU, who is about to take down for the day. Then we called up Buck Hill and asked if they wanted to try. 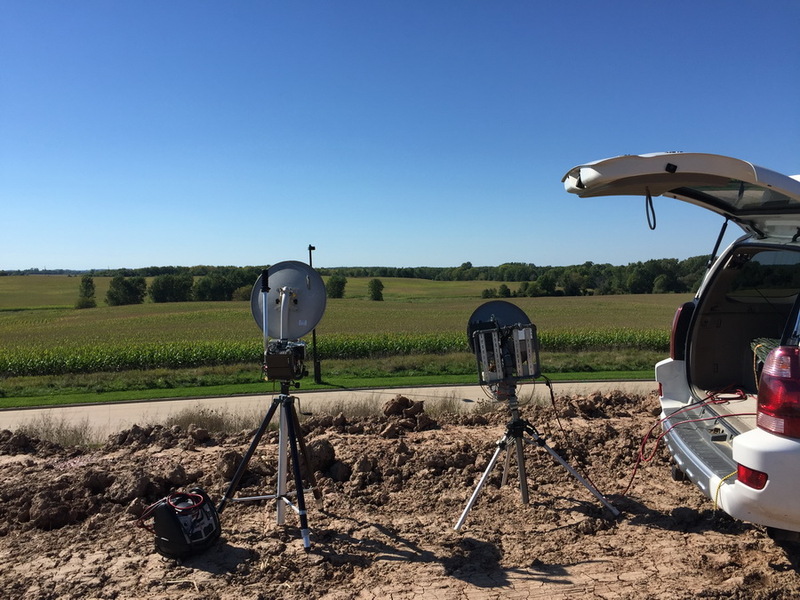 They had a few minutes while waiting for the Iowa rovers to move. We started beaconing back and forth. We heard something. We peaked it up and then they peaked up on our beaconing. 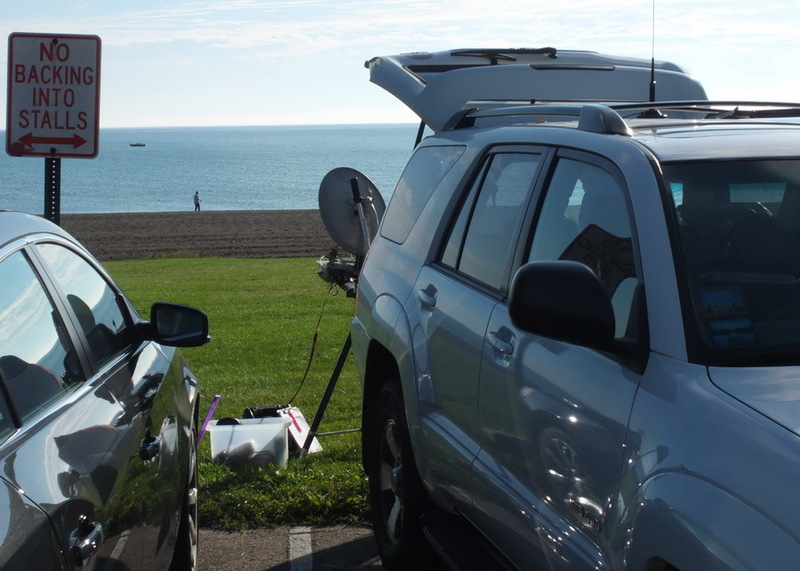 Then we completed weak CW QSOs, but they were 451 Km! In the middle of the afternoon! The picture above to the right is the view towards Buck Hill. Am I in or out of my element here? We drove to EN53ns where KA9VDU had operated earlier in the day. 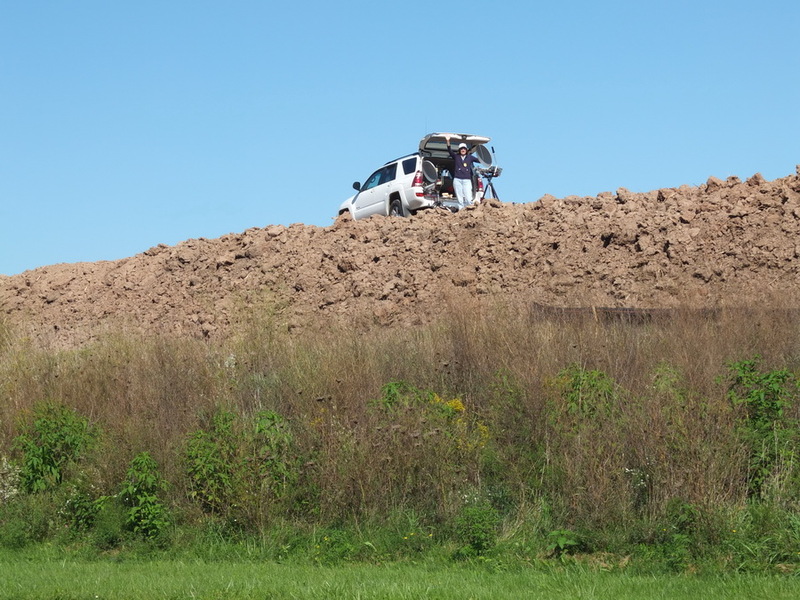 We noted that we could not work Buck Hill from there so we moved 2 miles north to find a clear shot towards the Hill. 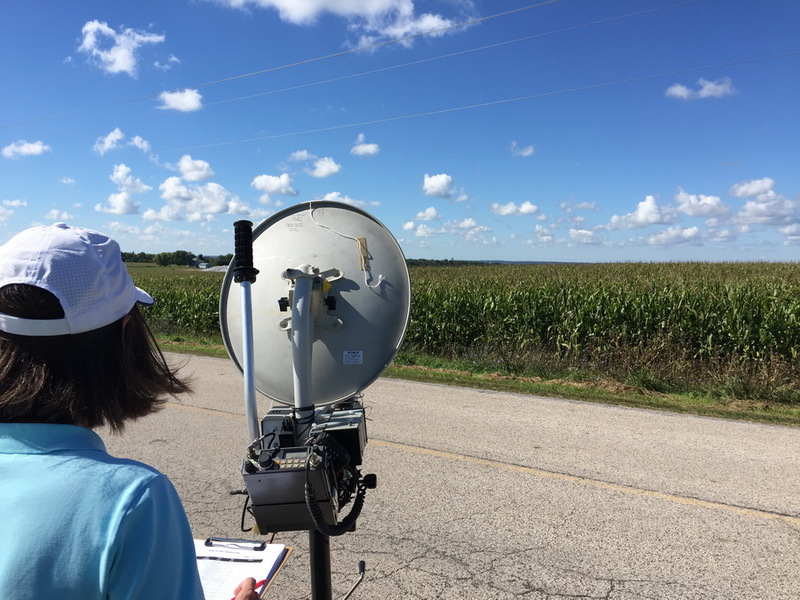 We completed some CW Q's over a 367 km path. 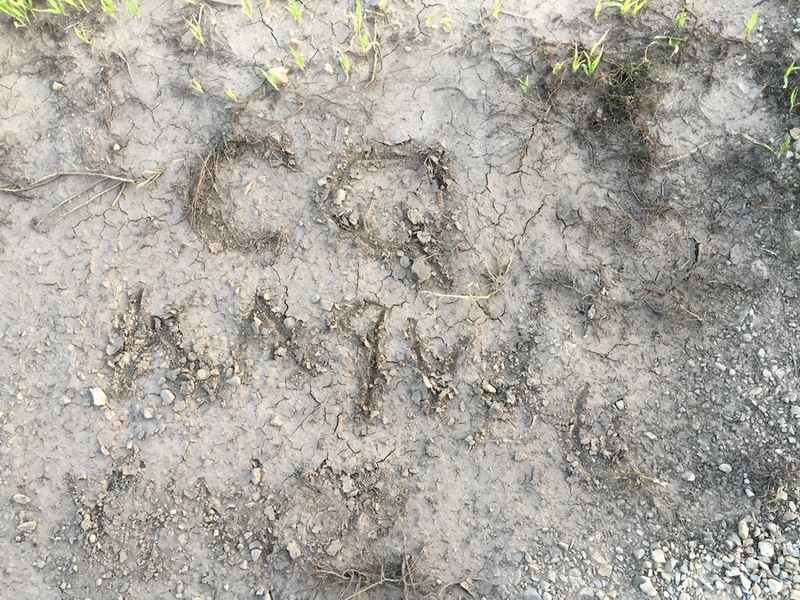 Then we returned to Greg's spot to find a message in the mud. The picture of Janice is while she is working K2YAZ for the last time of the day on a 264 km path. 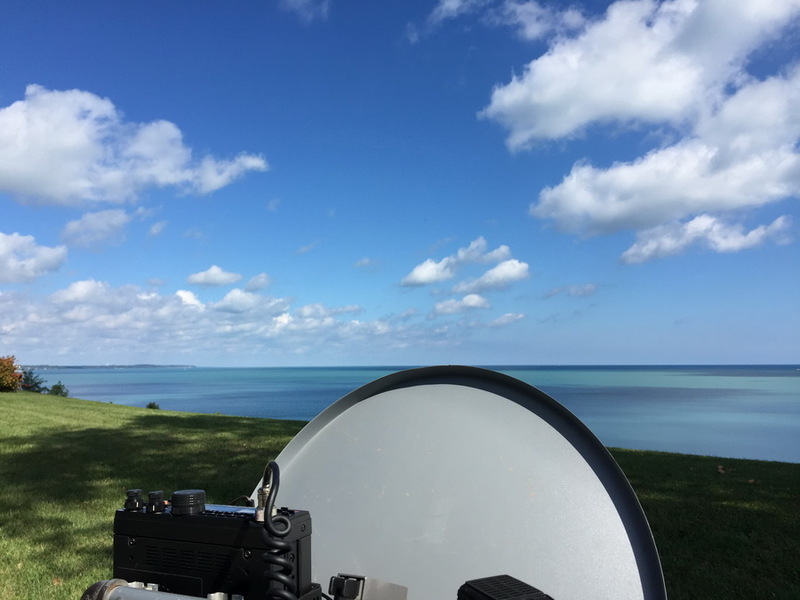 We also worked W9ZIH down in Illinois from here. Then we proceeded to nearby Ripon, WI for dinner at Culver's. Then we drove to our cabin and pulled in at 10:30pm. What a successful weekend! 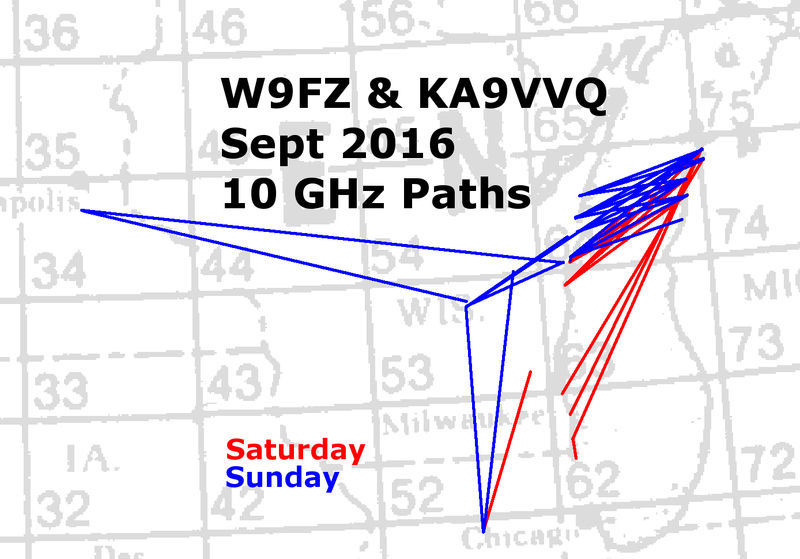 Here is a graphic of the paths Janice and I worked over this September weekend. 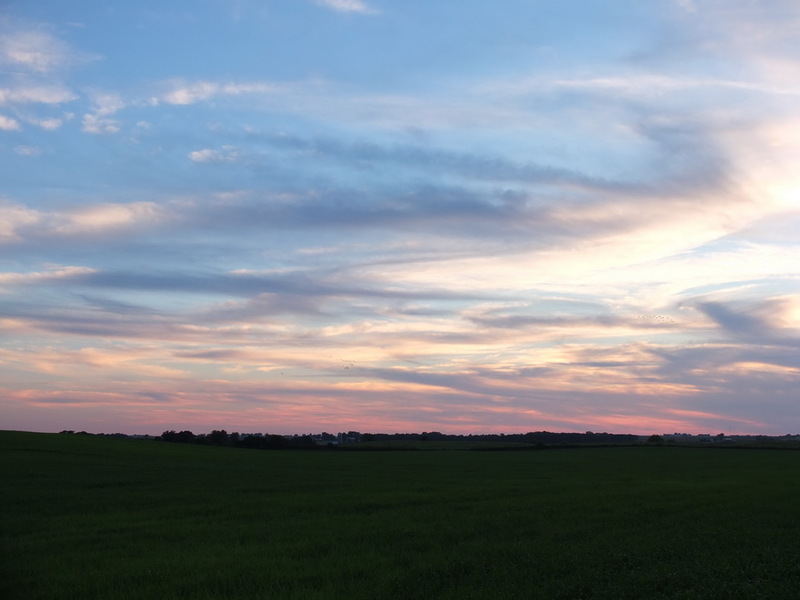 The real highlight was connecting on a 451 km shot from just west of Manitowoc, WI (EN64db) to Buck Hill (EN34ir) just south of the Twin Cities. It was CW and weak, but there they were in the middle of the afternoon! Thanks for giving it a shot! It was a wonderful weekend filled with fun and beauty.